Setting-up of the roving impregnating station. EHA Composite Machinery has developed filament winding plants to make fiber reinforced plastic rotor blade components for wind turbines. According to the company, an increasing number of wind turbines are being installed in low-wind regions (onshore). For this application, plants with large rotor diameters are used, demanding special logistic requirements. EHA’s manufacturing method enables the production of the rotor blades in segments so that they can be transported on overland routes with a small degree of efforts. A quick on-site installation is also possible. Filament wind plants of this size are already used in the sector of large-scale FRP containers as well as in the aerospace industry (Vega rocket motor, Ariane 5). This application was for ENERCON, a technology leader in the wind turbine sector. 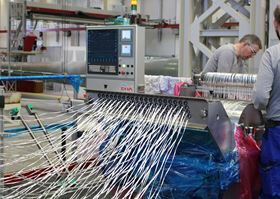 The machine applies glass fiber fabrics impregnated by epoxy resin alternately with glass rovings. In the areas of the flanges, local thickness increase is reached by mounting. When manufacturing products of this size, carrying the glass fiber material on a movable platform enables a nearly continuous material flow. Furthermore, material can be refilled without loss of time. With a rail length of almost 50 m, components with diameters of approximately 3m and a length of about 20 m can be produced. This story is reprinted from material from EHA, with editorial changes made by Materials Today. The views expressed in this article do not necessarily represent those of Elsevier.